It’s said that gradient mesh is one of the most powerful tools in a graphic designer’s Illustrator toolbox, but it isn’t easy to master the skill of using it. One of the biggest benefits of being able to use this tool effectively is that it helps you provide depth to a logo in ways that other tools can’t, enabling your to recreate shadows and highlights that give your logo a unique perspective. Here’s a beginner’s tutorial on how to use the gradient mesh tool. 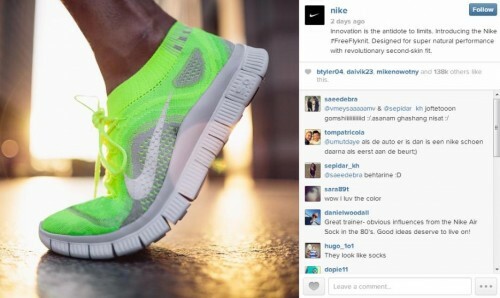 Analytics company Nitrogram recently released a list of the the top 50 brands on Instagram. Rankings included numbers of followers and mentions on the popular photo-sharing site. At the top of the Nitrogram 50? Nike, Starbucks, Forever 21, the NBA, and Adidas. These brands have hundreds of thousands – even millions – of followers who post their own photos with the brands’ hashtags. #Awesome. But what do these brands have in common that helps them succeed on Instagram? Take a look at the top 5 brands on Instagram to find out what they’re doing right. But Nike isn’t number one just because of its photos. The brand is integrating Instagram with their business in innovative, exciting ways. Nike PHOTOiD allows users to design their own custom Nike footwear based on their Instagram photos. Just upload an Instagram, choose a Nike shoe, and check out a unique design based on the colors in your photo. Starbucks sticks to the classic Instagram formula: simple pictures that somehow look both artistic and amateur. Starbucks’ uploads aren’t glossy, in-your-face advertisements. They’re photos with artsy angles, muted filters, and simple subjects. This post, captioned “Enjoy the little things,” shows a flower-filled Starbucks mug in front of a stack of unfinished canvases. 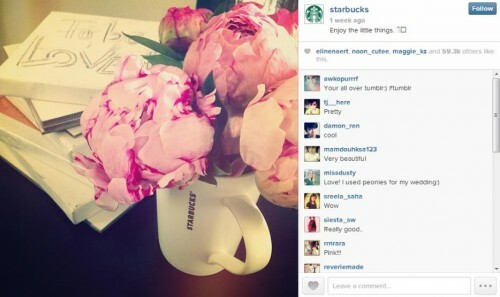 But Starbucks’ greatest strength on Instagram? Their lack of self-promotion. Most of Starbucks’ posts include minimal references to the brand. One, a summery shot of an iced coffee by a fountain, is only recognizable by the ubiquitous green straw. Some, like a photo of a father and daughter playing in the ocean, don’t have any brand references at all. Forever 21’s young fan base lends to their success, since most of Instagram’s users are between 18 and 29. But Forever 21’s photos are classic Instagram, too: artsy snapshots with vintage filters. Many of Forever 21’s uploads show partial shots of complete outfits — the post below depicts just a pair of bright blue pants and a hand with a matching manicure. Another one of Forever 21’s strengths is its use of Instagram to interact with customers. Rather than just posting photos of their products, Forever 21 encourages fans to upload their own ensembles for the chance to be featured on the brand’s Instagram account. 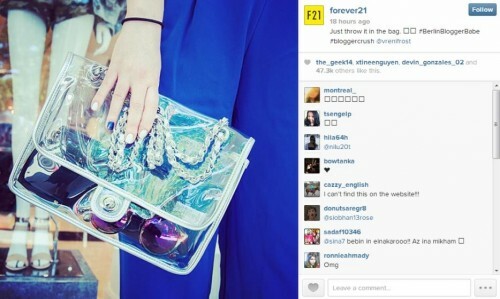 Fans get instant Instagram fame– and Forever 21 gets more followers and more mentions. It might be a surprise to see the NBA among the best brands on Instagram – basketball fans and photos with soft, artistic filters don’t seem to mesh. 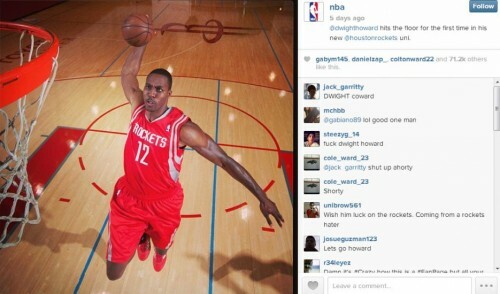 But the NBA’s Instagram account proves that they don’t have to. The NBA’s posts are typical sports photos: close-ups of athletes in action with minimal editing and no-nonsense captions, like this photo of Dwight Howard. The NBA faces a unique challenge on Instagram: keeping the attention of its fans and followers even after the season ends. The NBA accomplishes this by capitalizing on current events. Recent posts include NBA trades, ESPY award winners, and the off-season activities of its biggest stars; one shows Miami Heat player Chris Bosh on a trip to India. Adidas, which competes with top brand Nike in the athletic wear market, takes a slightly different approach. Their photos lack the artistic quality of Nike’s, instead trying for simplicity and consistency. Many of Adidas’ recent posts, like the one below, show nothing but a pair of Adidas shoes on a black background. They focus on the product rather than the presentation. 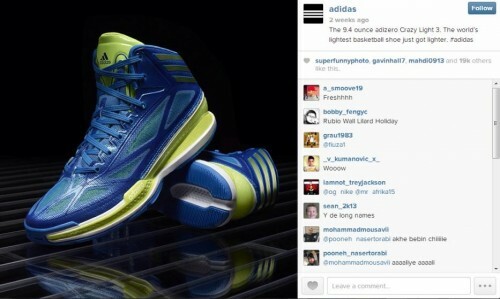 Adidas also jumps on popular Instagram trends like #tbt, or Throwback Thursday, to promote their brand. 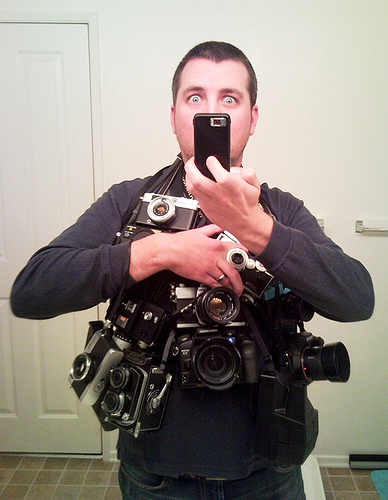 Each week on Throwback Thursday, millions of Instagram users post old pictures with the caption #tbt. On a recent Thursday, Adidas posted a #tbt of several classic Adidas shoes, inviting followers to comment with their favorites. Want to make the most of Instagram for your brand but not sure where to start? Take the lead from some of these big brands and apply them in the same way. Take simple photos and pair them with memorable captions that evoke a certain feeling you want to associate with your brand. Or go the way of Starbucks and go less promotional, more personal, which is what Instagram does so well thanks to its photo filters. Above all, be ready to engage with your customers by encouraging interaction with your posts, and maybe even asking for user submitted posts. Author’s Bio: Ryan Harris is an Internet marketing strategist and copywriter who specializes in working with businesses large and small to develop strong brands. He writes for a wide array of tech sites including DSL.com. Connect with Ryan directly via email. The facts are set in concrete; at this point it is wet concrete or perhaps quicksand because it can change. As it stands now income taxes, payroll taxes, capital gains and dividend taxes and employee health care benefit expenses are all increasing. With these indisputable facts in mind, what is the small business owner to do? If you are like me, you concentrate on increasing your market share and your sales volume within your current market share. GM suffered a devastating bankruptcy in 2009. Just two years later, they reported a record profit. With the announcement recently of a totally redesigned and improved Corvette, they are demonstrating their commitment to improved quality going forward. Even though the Corvette represents a miniscule portion of GM sales in comparison to its truck line, it demonstrates the resurgence of quality. The Corvette is the first vehicle to be launched since the bankruptcy. The customer demanded better quality and GM is responding. What does your customer want? 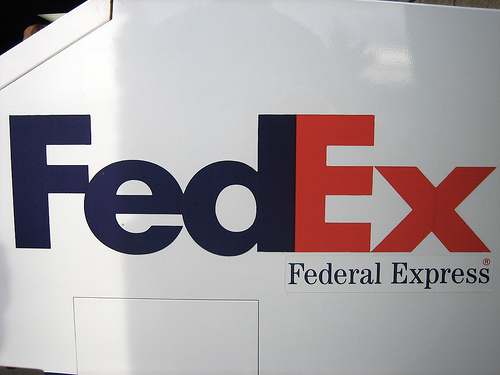 What are you delivering? If there is one place to cut corners, it has been proven throughout history that it is NOT in product quality, customer service or effective marketing. When you started your business, you researched what was currently available in the marketplace, what you could improve on the existing offerings and what unfilled niche remained. Go back to basics and do exactly the same research all over again. Market research studies, interviews of your customers and intelligent observations pinpoint areas in which you can improve your current product or service and add additional products or services to fill niches. Sometimes you need to create the niche by informing them of a benefit they had not fully realized they needed. Remember Apple’s introduction of the first iPhone? Steve Jobs presented the advantages of the iPhone before the marketplace even knew they needed those features combined. Once the areas to improve and expand are identified, take action. Make the improvements and launch to fill the niche. Keeping capital liquid allows small business owners the ability to capitalize on marketing opportunities. Small businesses can react very quickly to sales opportunities. An unexpected but delightful powder dump (several inches of light fluffy snowfall for the non-ski informed) is an excellent opportunity to push the word out to get to Steamboat Ski Resort quickly. Take advantage of a last second deal with the airlines to offer an incredibly low rate for Valentines, ‘take your sweetheart for a spring ski trip’Â deal on airfare and lodging. Search for new marketing opportunities and capitalize immediately. Create a new brochure for the newly discovered market niche using brochure design templates. Create a sales campaign to highlight the benefit your product or service offers to fill the market niche, why you are the best one to offer that benefit and a compelling reason to contact you immediately for more information. When you create an impressive marketing piece and produce it through the services of a top quality printing company (for example, check out PrintPlace.com), you are proud to present your marketing materials to your sales force and the marketplace. Expand upon the highlights of your new brochure and create booklets as additional distribution pieces. Duplicate the elements of your brochure and booklet into your website. Providing a consistent high quality image creates brand recognition. Customers need to see a consistent company image multiple times. They see your company online, see you in social media and hold your brochure in their hand; this repeated consistent image solidifies your brand in their mind and paves the way for a buying decision. Combining high quality printed marketing materials with your online presence captures the marketplace. Keep your money liquid and be ready to pounce on marketing opportunities. The best way to mitigate increased expenses is to increase revenue. Increase revenue through delivering superior products and services which fill market niches and high quality marketing to distribute your message to the marketplace. Increasing revenue is the small business owner’s lifesaver. What is your strategy for growing revenue this year?